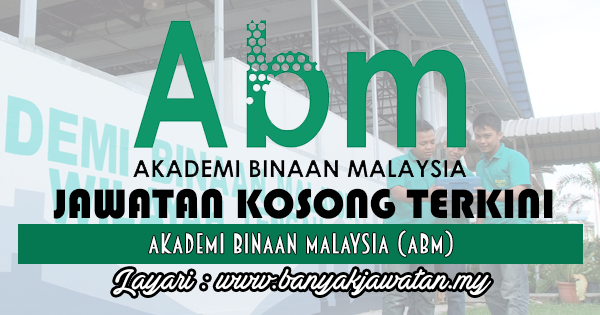 Akademi Binaan Malaysia (ABM) is an initiative by the CIDB Malaysia established to provide wide and comprehensive construction training in fulfilling the nation's human capacity building. ABM offers comprehensive training courses covering aspect relating to construction industrial manpower needs. Today, ABM has produce and trained more than 90,000 skilled construction personnel of which currently pursues a career with reputable construction company locally or abroad. ABM alumnus has been recognized by the construction industrial player and our students were in high demand for employment opportunities. At ABM, were are committed to serve the very best in enhancing individual's skills for the nation future development. 0 Response to "Jawatan Kosong di Akademi Binaan Malaysia (ABM) - 25 November 2017"